Dreaming of a life in Laval that mimics your favourite waterfront getaway? Just west of Highway 13 and Alismas Street, Aquablu Condominiums is a unique riverfront community with a lifestyle more commonly associated with resorts. Located on the shores of the Riviere des Prairies in a prestigious part of Sainte-Dorothee district, the Groupe Garabedian Lifestyle project is close to all the urban amenities you need, while remaining a prime sport for relaxation and recreation. Three towers will rest on a base equipped with a green roof and an outdoor, infinity-style pool. On the riverfront, there will also be a series of two-storey homes, each with an enclosed garage. 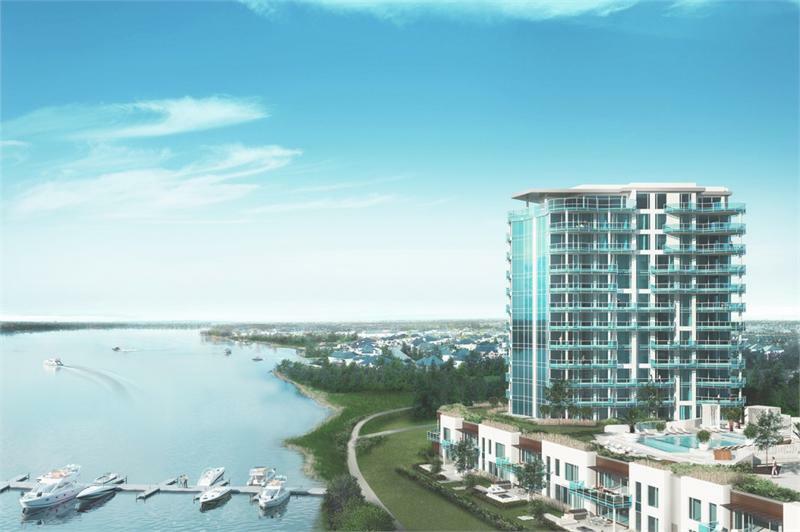 For intrepid boaters, Aquablu Condominiums already has a dock to accommodate vessels, though they are plans to expand the facilities into a full-fledged marina. Residents will be able to easily sail on the Riviere des Prairies or float along the nearby Lake of Deux-Montagnes, Lake Saint-Louis or Ottawa River. The serene, natural setting has wetlands close at hand and will also feature a new 30,000 square foot park. A bike path will even be built around the site, making the river accessible to all. Once inside, residents will be able to take the waterfront with them thanks to architecture that ensures river views. The first phase will feature a 12-storey tower made up of 68 suites. The spaces will be well-appointed, measuring from 1,100 to 3,600 square feet, with floor-to-ceiling windows. The condo ceilings also soar to great heights, giving each suite a light and airy feeling. They start at 10 feet high, though the ground floor and top three floors are equipped with 11 foot ceilings. The two-storey homes along the waterfront are similarly expansive: they range from 2,500 to 3,000 square feet with a terrace on the ground floor and second floor balcony as well. Each residence will come with a chic Poggenpohl kitchen from Germany and will be wired with the latest in smart technology. 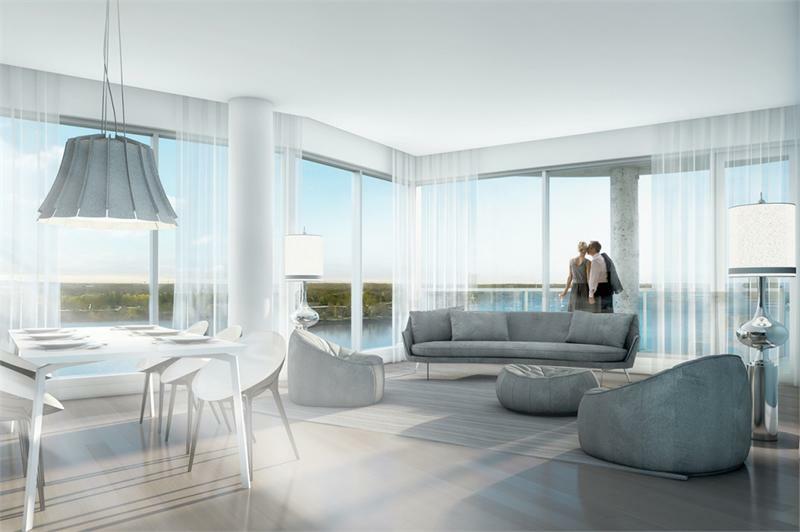 Need to see what life at Aquablu Condominiums will look like? Check out this new video about the opportunity for exquisite resort-style living coming to Laval. A sales office is currently under construction at 108 chemin du Bord de l’Eau. It will feature a full scale model suite, replicating one of the 1,600-square foot condos. We can’t wait to hear what the next two phases of the project have in store! Suites start from the $400,000s. For more information register at condosaqublu.com or contact 514 654 2782.